Don’t miss out on the next program! Sign up for our monthly email by sending the word “monthly” to e.hile@copeenvironmental.org. We encourage all community members to carpool to these events as on-site parking is limited. Join us monthly where kids explore the outdoors of CEC through a story, hands-on activities, crafts, and a hike. Children must be accompanied by an adult. Be sure to dress for the weather! Toddler Time happens rain or shine! Time: 10-11 a.m. Place: CEC Fee: $3 per toddler for pre-registration OR $5 per toddler for day-of registration. May 15 – Are You My Mother? June 19 – Tadpole Tales! Check back for more Toddler Time announcements! The following is the schedule for upcoming events and programs in February. For more information, call us at 765-855-3188. Registration for Summer Adventure Programs is now open everyone! Check out our 2019 Summer Program Flyer for all of the awesome camps we have planned for the kiddos this year. 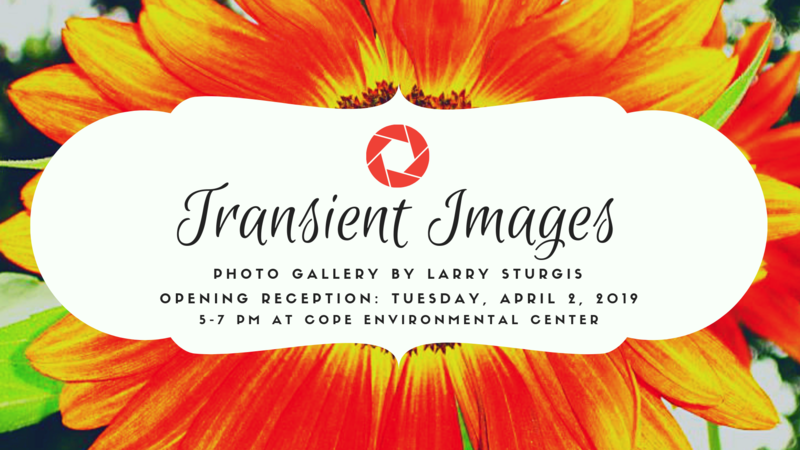 Cope Environmental Center invites you to attend the opening reception for “Transient Images”, a photography gallery by Larry Sturgis. Join us for an evening of light refreshments, good company, and images that capture the transient, in-between moments of happenings that occur all around us. All artwork is for sale and 30% of the purchase price goes back to Cope Environmental Center. Time to view the gallery: Mon. 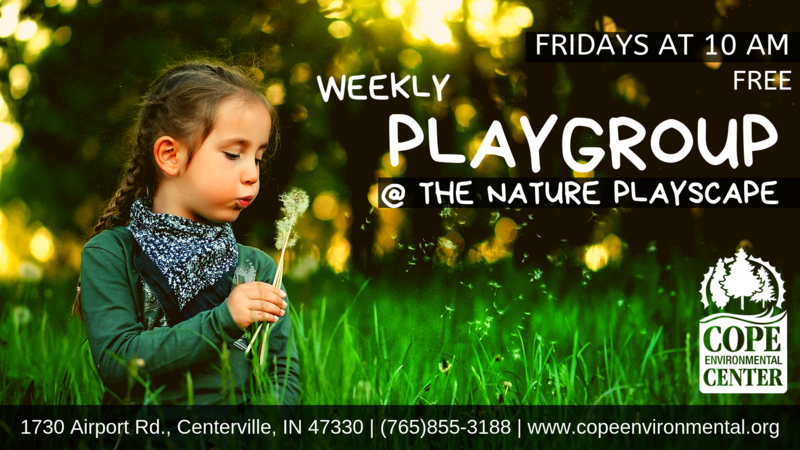 – Fri., from 9 a.m. – 5 p.m. and the first Saturday of every month from 10 a.m. to 2 p.m.
CEC is introducing a new, self-led program: Weekly Playgroup @ the Nature Playscape. Playgroup happens every Friday at 10 a.m.
Our trails and Nature Playscape are open every day dawn to dusk, and playtime could be any time, but the goal of the playgroup is to create a coordinated time for parents and guardians to bring their kiddos out for group socialization and outdoor play. The more the merrier! This program is meant to be fun and casual so that everyone can move at their own pace, and come and go as they please. For those who arrive at 10 a.m., a staff member or volunteer will be available to lead everyone to the Nature Playscape and give a brief welcome and introduction. Weekly Playgroup @ the Nature Playscape. It’s a great time for play time! 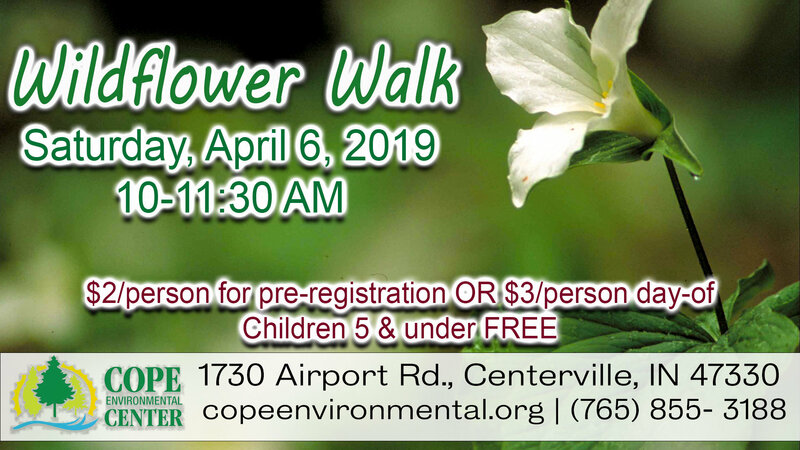 Come out to Cope on Saturday, April 6, 2019, from 10-11:30 a.m. for a Spring Wildflower Walk! Trilliums, trout lilies, and Dutchman’s breeches, oh my! Discover the native species of wildflowers that can be found here at CEC. The program is open to all ages. $2/person if you register before the program. $3/person for day-of registration. Children 5 & under are FREE! Date & Time: Saturday, April 6, 2019, from 10 – 11:30 a.m.
Fee: $2/person if you register before the program. $3/person for day-of registration. Children 5 & under are FREE! Call (765) 855- 3188 or send us a FB message to register! 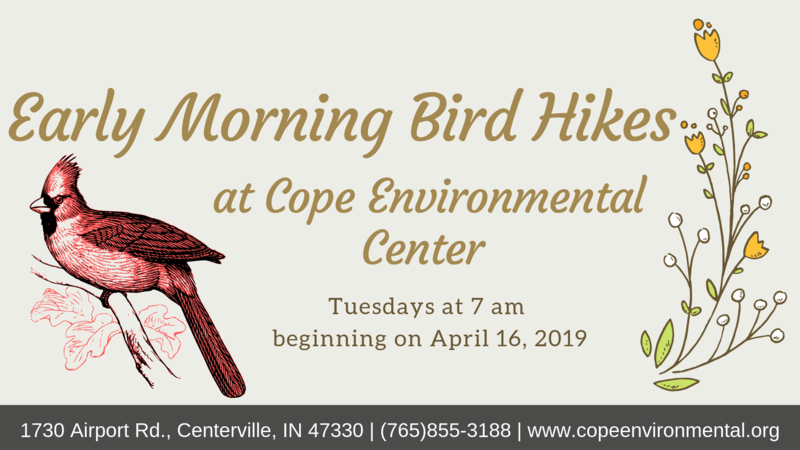 Free early morning bird hikes are returning to Cope Environmental Center (CEC) this spring. Visit CEC on Tuesday mornings from 7-9 a.m. starting April 16, 2019. Bird specialist’s Jim Seany and Ron Williams will be leading the hikes. These hikes offer an opportunity for bird enthusiasts, experts, and aficionados to come and share their knowledge of and excitement about birds. You could spot a robin, hear the call of the red-winged blackbird, or go on a “wild-goose chase” for the elusive, marsh-dwelling Sora. There is no fee for these hikes. Registration is not required. Please note that these hikes are subject to cancellation due to weather. April 23 & 30, 2019 at 7-9 a.m. 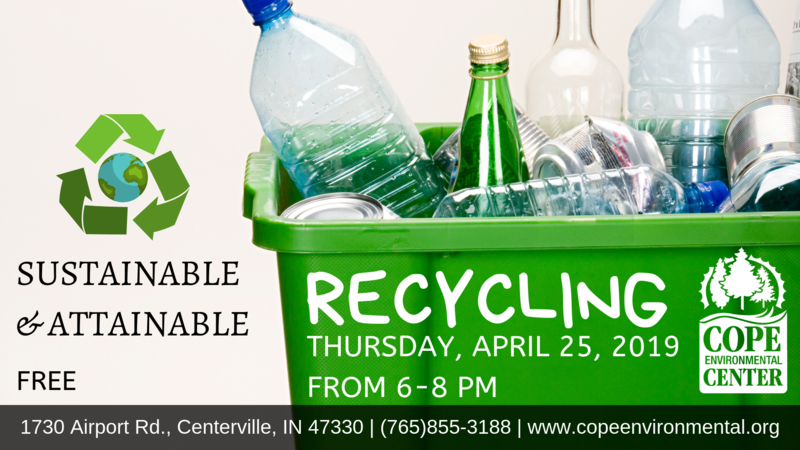 Contact CEC at 765-855-3188 or head to www.copeenvironmental.org for more information. You are never too young to enjoy nature! 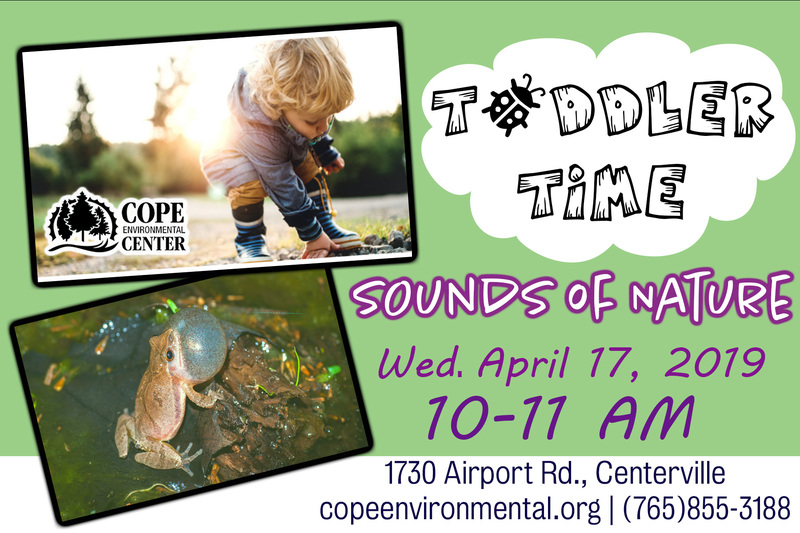 Join us for monthly Toddler Time where kids explore the outdoors of CEC through a story, hands-on activities, crafts, and a hike. Children must be accompanied by an adult. Be sure to dress for the weather. Toddler Time happens rain or shine. Place: 1730 Airport Rd., Centerville, Ind. Registration: Required. We ask that you sign up before the day of the program – there is a price increase for day-of-program registration. To register, visit our toddler time page, or call us at (765)855-3188. Do you have questions about recycling in Wayne County? Representatives from public-private sector recycling will be on hand to discuss the recycling process. There will be a Q&A section. Light refreshments will be provided. No RSVP required. Fee: Free. Donations are accepted. Come celebrate our amazing planet, the life it supports, and what our community is doing to protect it at Family Earth Day Celebration! This FREE event will feature fun games and activities for all ages, information from Earth-friendly organizations and non-profits, and animal shows. Don’t miss the fun! 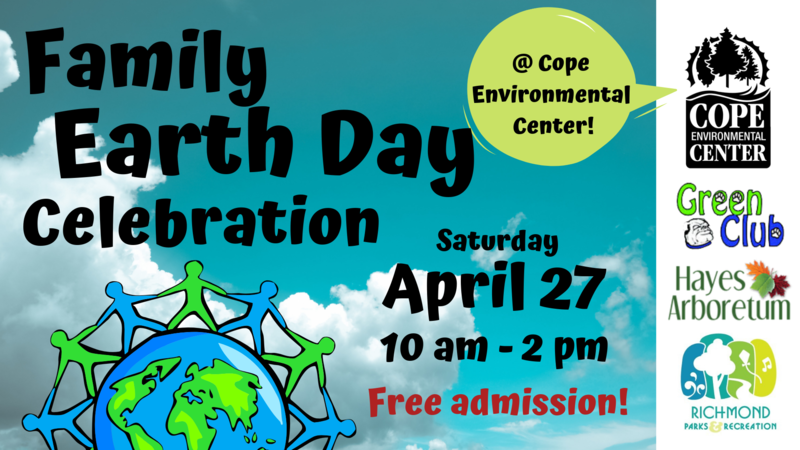 Come on over to Cope Environmental Center on Saturday, April 27, 2019, from 10 a.m. to 2 p.m. Come for the food, come for the fun, come for the fantastic vendors, competitions, and prizes! Are you ready to show off your art skills? Then the T-shirt design contest is for you! 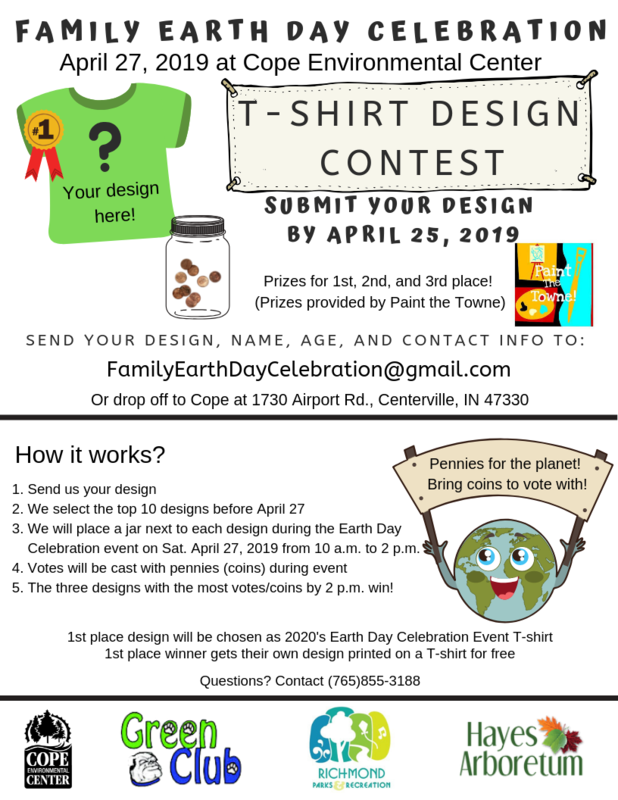 Your design could be the winning design and “brought to life” for 2020’s official Earth Day T-shirt! How cool is that! Are you a vendor, organization, or business? If you’re ready to sign up for a booth, visit our page for a registration form! Recycle your old electronics so that parts can be re-purposed. Don’t let useful parts go to waste in the landfill. E-Waste Recycling happens on the fourth Saturday of every month (except holidays) from 9 a.m. to noon. Time: 9 a.m. – noon. For more information about recycling please visit our resource page. 5/4 – Saturday “Growing Lunch” Program from 10–11:30 a.m.
5/7 – Tuesday Early Morning Bird Walk from 7-9 a.m.
5/14 – Tuesday Early Morning Bird Walk from 7-9 a.m.
5/15- Toddler Time: Are You My Mother? from 10–11 a.m.
5/18 – Kids to Parks Day at CEC from 10 a.m.–2 p.m.
5/21 – Tuesday Early Morning Bird Walk from 7-9 a.m.
5/23- Sustainable & Attainable: Compost from 6-8 p.m.
5/28 – Tuesday Early Morning Bird Walk from 7-9 a.m. Check back next month for more events and programs at CEC! 6/1 – Saturday “Planting for Butterflies” Program from 10 – 11:30 a.m.
6/19 – Toddler Time: Tadpole Tales! from 10 – 11 a.m.
6/20 – Sustainable & Attainable: TBA from 6 – 8 p.m.
6/22 – E-Waste Recycling @ IUE from 9 a.m. – 12 p.m.
6/24 – Gleaners Food Drop 9 – 11 a.m.
7/17- Toddler Time: Solar Snacks from 10-11 a.m.
7/22 – Gleaners Food Drop 9 – 11 a.m.
8/3 – Saturday Program: “Wild Wetlands” from 10-11:30 a.m.
8/21- Toddler Time: Monarch Madness from 10-11 a.m. Check back for more upcoming programs and events! What do you think about our programs and events? Let us know!